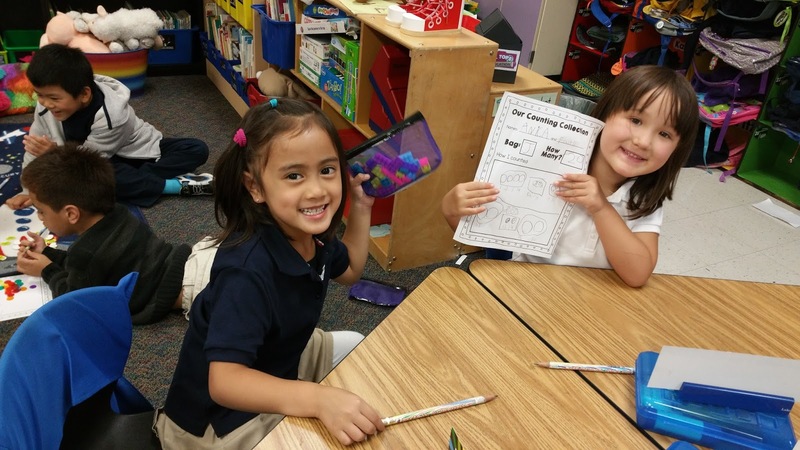 Here's another peek into how my classroom works! This year I have a whopping 27 kindergarteners! I've never had problems getting kids in line, but this year there were just so many that they were winding around and around the classroom. 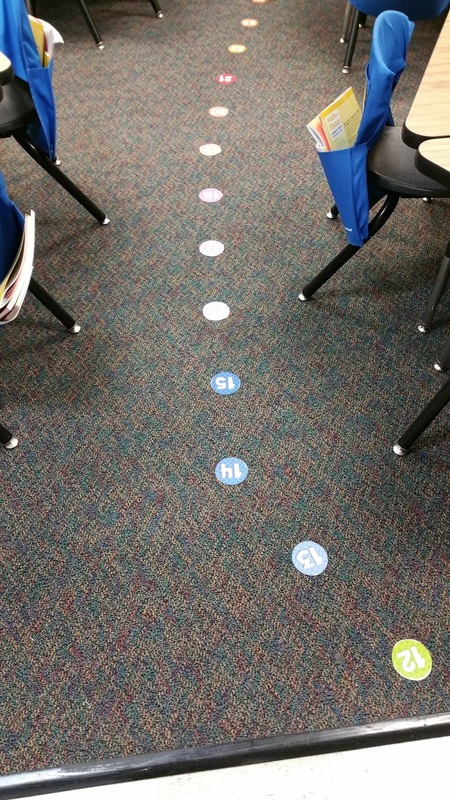 I've seen the idea around where teachers put numbers on the floor to help kids find their spot, but I was hesitant to try it because I have both carpet and tile where students line up. 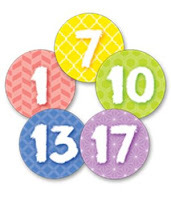 This summer, I purchased these calendar numbers (because rainbow) and got them ready for the floor. After the first few days of school, I decided that we REALLY needed them! 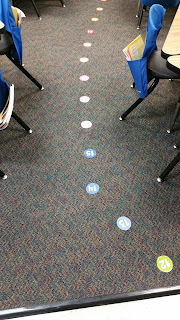 I used clear contact paper to tape the numbers on the tile, then I used velcro to attach the numbers to the carpet. So far, they haven't moved! They have to wind around the tables and chairs, but it works! I spaced them about 10" apart. Every year, I have my students line up alphabetically by first name. This is how I do line order. Sometimes I switch it up and do "backwards line order" and reverse it, but last year the kids didn't seem to mind staying the same the whole year. I like doing it alphabetically because I can easily tell who is in the wrong place and see if anyone is missing. One of my teaching super powers is that I can memorize my entire class list alphabetically and recall it pretty easily, so this method of lining up works well for me! I know other teachers give their students numbers, and that would definitely make it easier. My students know that when they line up they go to a certain number in the classroom, but outside they just look for friends that they stand by. Adding the number spots on the floor has definitely sped up our line up process. I can have kids line up all at once and more quickly because they know exactly where to stand. Another trick that I use is that I put painters tape in the hallway where I want them to stop. Since the line is so long, I have trouble watching kids as they come out of the classroom and also be there to tell them where to stop. It has only been 13 days of school, so we're still getting the hang of things, but the tape definitely helps! That's it for today! I hope that was helpful for you! See you next time! I wanted to share a new part of my math block. 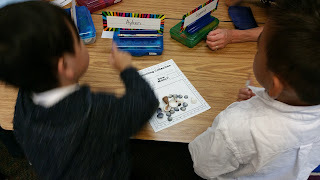 This summer, we learned about "Counting Collections" and were asked to try it on in our classrooms this year. I think it's a great idea and tried it out this week for the first time! It's really similar to Counting Jars that I've seen all over the internet. 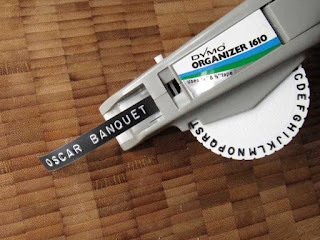 Basically, you ask students to count objects and somehow record how they did it. At our training, the University of Washington had been piloting their research at a nearby school and brought some teachers to talk to us about it. We watched this video, which was filmed at a nearby school, and UW worked with this school also! Counting Collections: Kindergarten - a common core classroom friendly exercise from Luna Productions on Vimeo. This summer, I got my counting collections ready by collecting random things--bottle caps, shells, erasers from the Dollar Spot, etc. I ordered these cosmetic travel bags to use as storage. So far they are working out well! At the end, we shared a few different ways that we recorded. I saw a lot of differences in their recording... some students used the paper as a mat and didn't write anything at all. A lot of students had trouble writing the actual numbers, but I don't blame them since we've only learned up to #4 officially so far. I saw some great team work and counting strategies--some kids were taking turns counting, others were counting together. Check out this amazing recording sheet! Some kids were laying out their objects in lines. I was just so excited about everything I was seeing, and I can't wait to do it again! 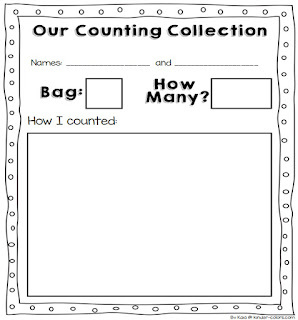 I can see so many benefits to counting collections and it was relatively easy to set up. I love that they work in partners together. Teamwork is one of the biggest "life-skill" type topics that I feel is essential to careers later in life. 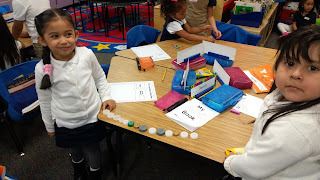 They practice counting actual objects instead of just rote counting. They can problem solve and figure out what counting strategies work for them. 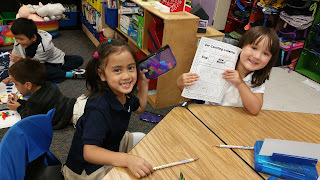 They practice recording their thinking and how they counted. I also added my recording sheet as a FREEBIE in my TpT Store! Enjoy! It's been awhile again... sorry about that! We just finished our second week of school and I'm still trying to play catch up with everything! I haven't even watched many scopes this week! 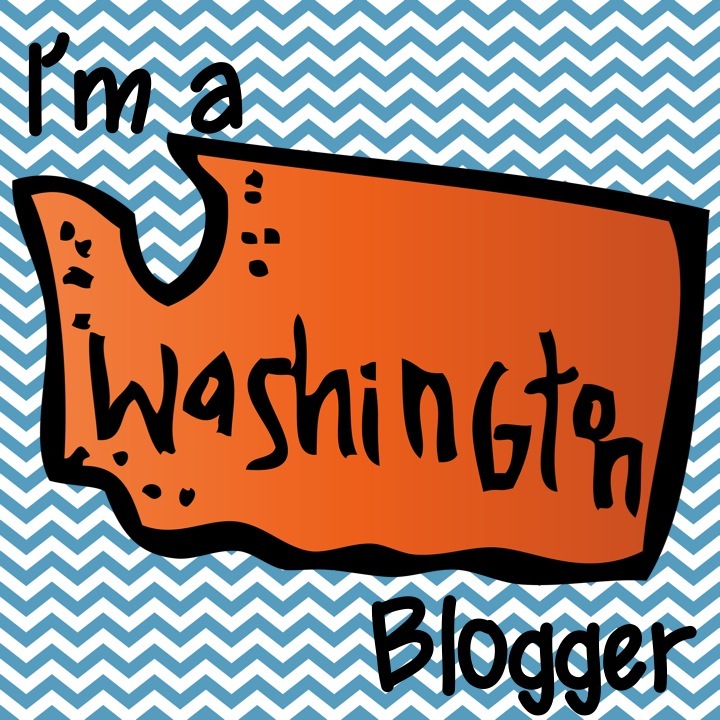 As I was thinking about blogging, and thinking how I should be blogging more, I wanted to kind of rethink how I use my blog. I want it to be a source of information. I want it to be helpful for other teachers! I want to share what I'm doing in hopes that it makes someone else's life easier. I want to do a little subcategory or "miniseries" of posts that are solely dedicated to what I do everyday. I think some of the best professional development I've had has been from simply watching other teachers do what they do. Kind of like "A Day in the Life of..."
So, introducing... "How I Do It"
Today's How I Do It--My morning check-in board, attendance, and managing bathroom and students out of the classroom. 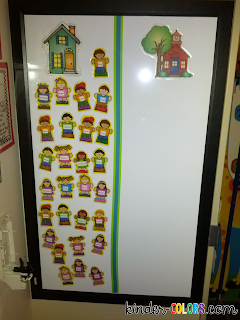 I used my P-Touch to add names on the little cut-outs and laminated them, then stuck a magnet on the back. 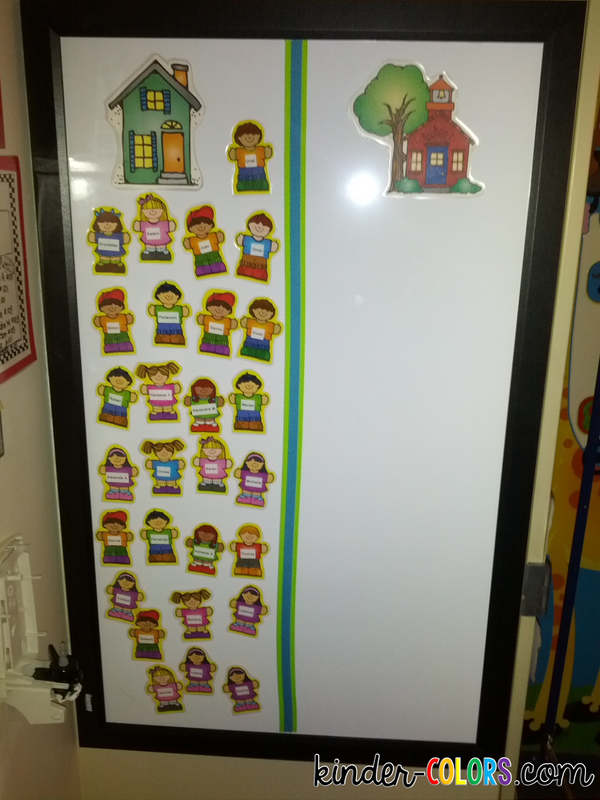 I used this system when I taught 1st and 2nd grade, but switched it up just little bit when I moved back to kindergarten. 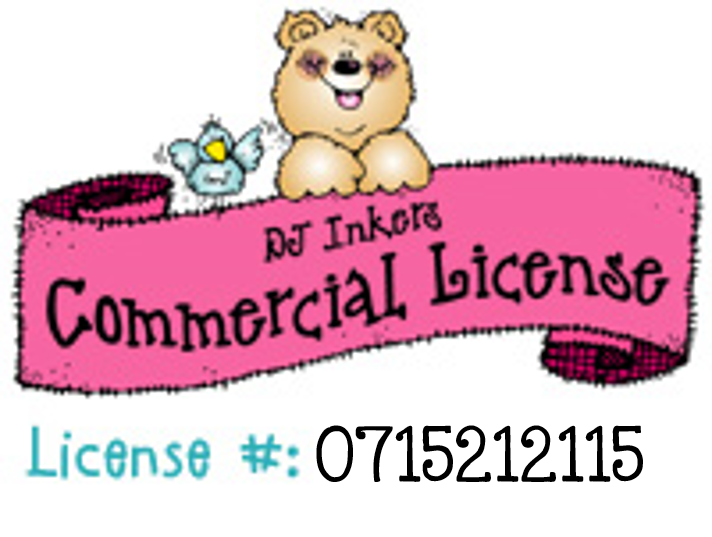 Instead of using clip art, I used their actual picture! I found little mini magnet photo frames at the Target dollar spot one year and bought those up. I take a class set of pictures at the beginning of the year to use for various things, and I print a few sets for me to use. I tried to find a picture of them in use, but I don't think I have one! You can see the little frames here, they're 2x3" magnet photo frames. This year I have a lot more kids and my magnet frames were getting pretty beat up, so I decided to go with 2.25" plastic circle buttons from Michaels. My mom used her circle cutter to cut 2" circles from the photos and a P-Touch to label them with names. I mounted each photo on a piece of scrapbook paper and stuck it in the button. They came out pretty cute, if I do say so myself! This was another little whiteboard that I bordered with scrapbook paper and added a couple clipart pictures. 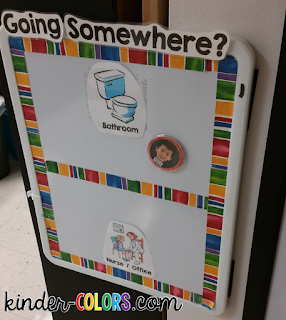 The first thing students do when they walk in the door is move their magnet from the "Home" side to the "School" side. I have a rule where they can only move their OWN magnet and never touch someone else's. After most kids are in the door and I'm taking attendance, I have my Teacher's Helper go and see which students are not there. They will read the names of the students still on the "Home" side and we say "____ isn't here, is that true?" and we check each one. Kids still forget to check in sometimes, even at the end of the year! After we've established who is absent, we go about our morning. At the end of the day, I move all the magnets back to the Home side. 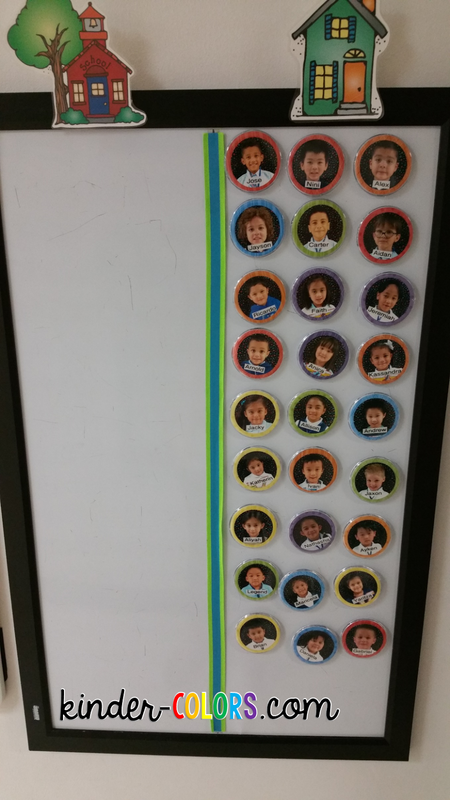 If I have a really responsible student, I have them help me with it just before dismissal, but I usually like to do it myself because the magnets can fall and break if you're not too careful. 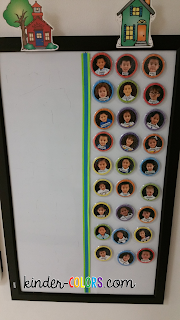 My check-in board is an essential part of my everyday classroom happenings! 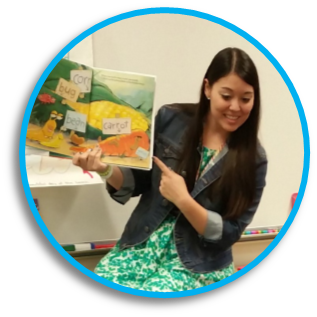 I hope you liked taking a peek into how my classroom works! Let me know if you have any questions about it!